Stages of Grief made simple. This chart may help you as well as families understand the emotions they are experiencing. In Home Pet Euthanasia Techniques: Written by Dr. Kathleen Cooney, for veterinarians, students, hospice providers, and technicians to help them gain comfort providing pet euthanasia in the home setting, including well described illustrations. Hospice and Palliative Care for Companion Animals: Principles and Practice. The first comprehensive reference to veterinary hospice and palliative care, with practical guidance and best practices for caring for sick and dying animals.veterinary teams experience. The Companion Animal Euthanasia Training Academy: providing education to improve the overall experience for the pet, caeregivers and veterinary team. CHECKLIST PREPARING FAMILIES FOR EUTHANASIA: Here is a brief checklist of things to discuss with families prior to euthanasia to help reduce stress during the experience. Alternate Routes for Euthanasia by Dr. Mary Gardner: Euthanasia methods that minimize stress may not always involve an IV catheter. 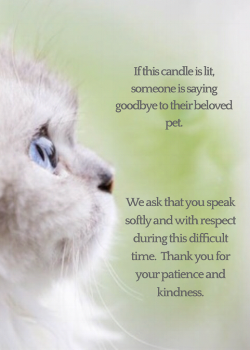 IF THIS CANDLE IS LIT: This is a document that when placed next to an LED candle, will inform those in the waiting room that a euthanasia is being performed and thus help reduce the amount of noise in the clinic during this delicate time. Ink pad OR Calligraphy ink and a paint brush OR a bingo marker. if doing a paw print (vs. a nose print), wipe paw with alcohol first. This will allow it to absorb more ink and remove dirt. Place paw or nose on ink pad, paint with calligraphy ink or use a bingo and press onto one or more pieces of card stock (or textured paper). For the nose print, rock the nose on the paper. make more than one print for each child in the family or for members that were not able to be there. The name of the pet and date can then be added to the piece(s) of paper and now you've created a lasting memory for the pets family! You can then send the paw print along with the sympathy card*. Healing may have started and receiving a card a week or two later can bring back unwanted memories from the euthanasia. Check out our sympathy cards here. The Quality of Life Question we all should be asking. An article by Dr. Buisson on the questions to ask ourselves when we have to take the decision.